PlayWrite’s professional coaches and actors work one-on-one with youth at the edge. Participants write and direct their own character-driven plays. By creating powerfully original art, writers learn profound emotional tools to trust themselves, manage their trauma, and heal. Our ten-day intensive workshops run throughout the year. 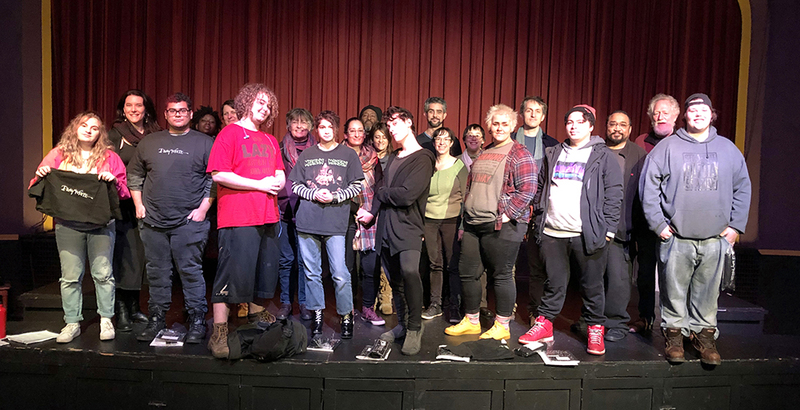 Graduating Class of PlayWrite’s 2018 workshop with students at Mt Scott Learning Center, onstage at the Clinton St Theater. — Katrina, a 2007 participant in PlayWrite. Katrina studied at PCC Sylvania in Portland, supported by a Chaffee Educational Grant, Oregon Opportunity Grant, and Federal Work-Study funding. She is member of the Yurok Nation. Currently Katrina is Content Manager and Writer for a Los Angeles cosplay magazine. The hippocampus, derived from the Greek word for seahorse, is a key anatomical structure in the brain. Amazingly complex, neuroscientists continue to discover more about how it functions: there is general agreement that the hippocampus plays a central role in the human capacity to turn personally experienced events and their associated emotions into memories. The PlayWrite workshop - combining written expression with movement - provides an opportunity for young people to unscramble complex emotional experiences into narrative form.